Mini art was a mega-talking point during Fotanian Open Studios 2008. 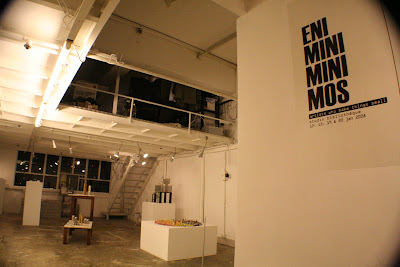 The exhibition, entitled Eniminiminimos: Artists who make things small, opened on 12 Jan 2008, 2pm at Studio Bibliothèque, Hong Kong, and continued on 13, 19 & 20 Jan 2008, 2 – 8pm daily. Curated by Singapore-born, Hong Kong-based artist Michael Lee Hong Hwee, the exhibition showcased 13 works by 12 international artists from Hong Kong, Singapore and Britain. 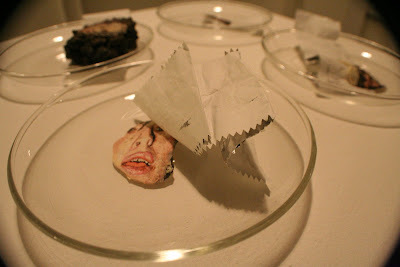 In their individual ways, the works by these artists challenged the global and dominant ‘size fetish’ that equates physical size with social importance. 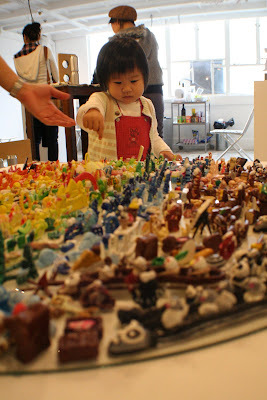 The crowd pleaser was surely Esther Yip’s collection of toylike figurines, with their sheer number (about 800 pieces in all), minute size (ranging from 1 to 4cm in height each) and chirpy colours. 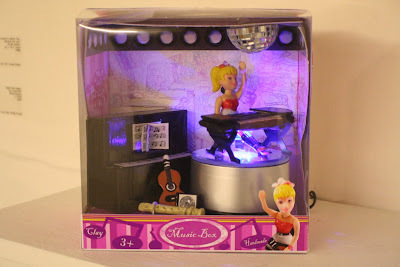 Esther also exhibited a kinetic piece, a box-set featuring Barbie trying her hands at the traditional guzheng instrument. 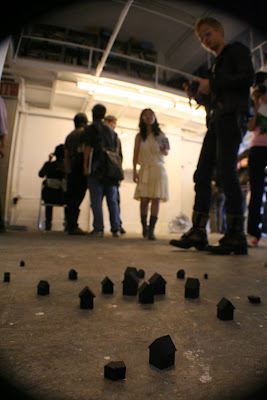 Similarly small but less in number, Suki Chan’s floor installation of black houses got viewers to feel psychologically bigger, much like Gulliver, and to reflect on personal and collectives memories. The other architectural model in the show was by Chun Kai Feng: It featured a small-scale model of van Gogh’s bedroom in Arles, reflecting an artist’s constant struggle to be an individual nonetheless concerned with the larger community. 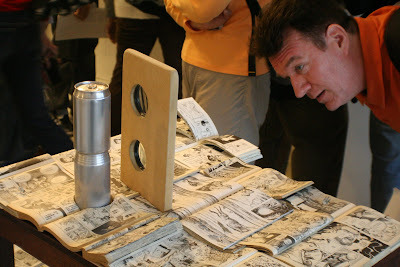 Two-dimensional art was given new spins by several participants of the show. 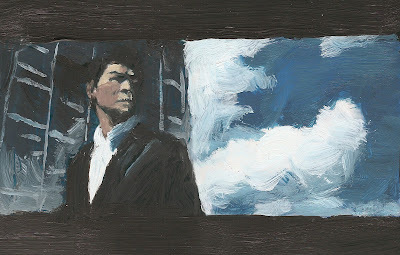 Chow Chun-fai has painted key frames from an excerpt off the film Infernal Affairs as miniature stills, which he then reconstructed into a lo-fi animation. 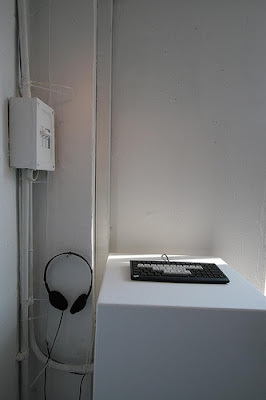 Shown for the first time on a mini-monitor whose screen size matched the dimensions of his paintings, the work focused the visitors attention on layers of visual and audio information about urban life. Debbie Hill uses chewing gum as her canvas for her painting of portraits of stars who have gotten into trouble, e.g., Britney Spears, questioning if we often subject public figures to higher standard of morality. 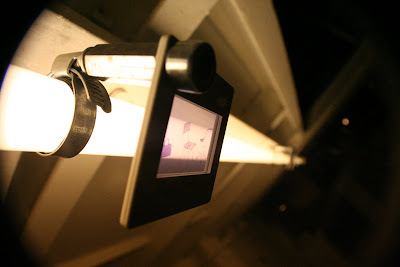 Cornelia Erdmann’s drawings of domestic furniture on slides were noticeable only to the attentive and patient visitors. 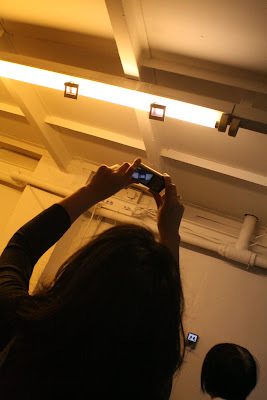 Installed onto flourescent tubes on the studio’s ceiling, the work also required viewers to stretch their bodies to scrutinise details. Tang Kwok Hin’s assemblage featured tiny figures, some of which were left behind after he sanded beer cans of their labels, others cut out from comics he laid into a landscape. 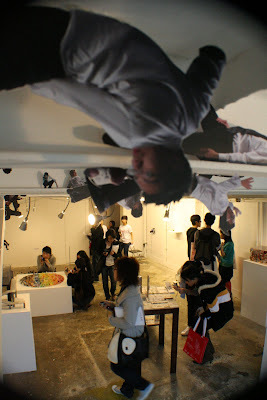 Michael Lee brought photographs off the wall and the book by fixing hundreds of self-portrait cutouts onto the architectural elements of the exhibition space. This show also brought in practitioners not steeped in the visual arts circle. 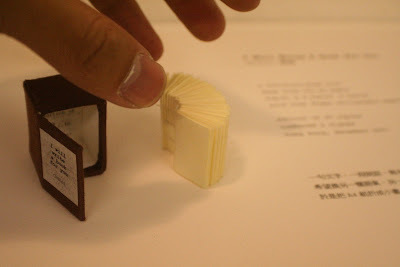 Known more for his comics and illustrations, Chihoi shown a small book handmade from a single piece of A4-size paper and a single piece of thread. 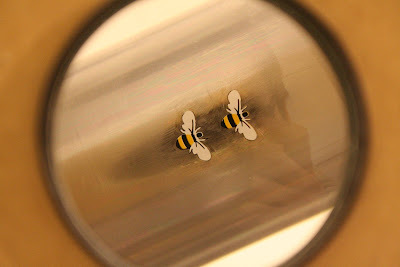 Full-time miniaturist Li Loi-yau proved that in this age of speed, technology and online-shopping, it is still important to make highly personalised gifts for people who matter: She exhibited a miniature sports shop which she made over a few years for her son. 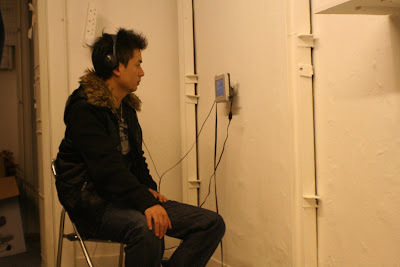 Sound artist Sid:Ned set up his compilation of one-minute “schizophrenic sounds” as an interactive piece with which audiences may select tracks to listen in to. The notion that “small is big” was most apparent with a huge crowd gathering to watch Justin Wong’s animation piece on the tiny screen of an iPod. In it, audiences were treated to ten dreamlike sequences in which big-size and small-size people meet. This exhibition is the second installment of the Things Artists Do series conceived by Studio Bibliothèque. 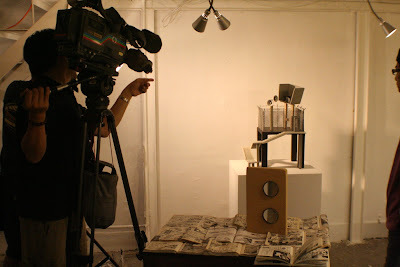 Studio Bibliothèque was one of 34 studios that opened their doors to the public over the same period in the annual Fotanian: Fotan Artists Open Studios event. Some 4500 members of the public visited the event this year. 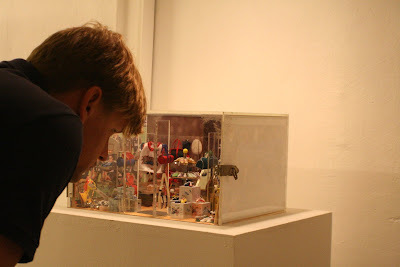 While a visitor (left) gaped at more mini-portraits of Michael Lee stuck on the ceiling and railing, one (second from left) helped himself to the refreshments while another (second from right) savoured the spread of reference books related to the exhibition theme of miniature art. wow...so this is where you live? looks like u hold many exhibitions here too. We are very 'sui(2) bian(4).' As long as we have a resting place, it will be good. 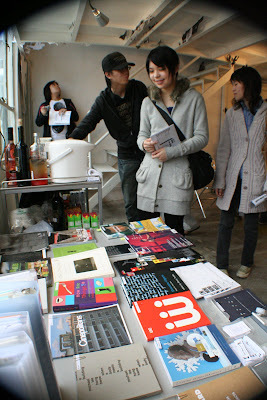 I will also check with HP if he is keen :D Hope to see you soon. A common stereotype is putting poker on par with games of chance , such as, for example roulette . And what are the benefits of such games , which always has the most happiness? The reasoning quite correct , except for the fact that poker is not a game of chance but strategic in addition quite instructive . Anyone who knows even the basics of this game and learn to use them , has the potential to solve more problems that it poses to life. It's an intellectual game that helps kick-start our gray cells and poker training calculations using the monitor , allows for quick and efficient counting also in everyday life. Playing poker online is also an opportunity for new players . 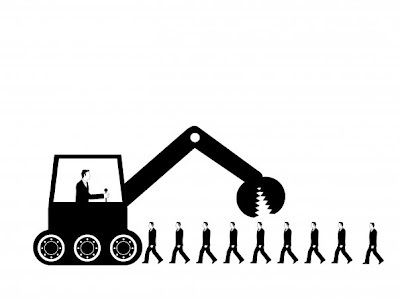 A person who is just starting playing poker , it's hard to get under the care of experienced players. Play online options that offer poker rooms allow for control of their plays , and the opportunity to discuss about them in various forums . In addition , a lot of online tournaments is your ticket to great live events for free, while in other cases we would have to pay a lot of money for the registration fee. Regular competitions and cost-effective systems in the VIP room , a lot of help to earn and become much more profitable than the standard game in casinos .